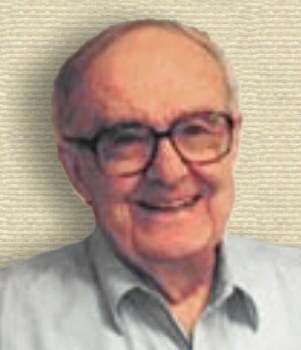 American astronomer who co-discovered (1960), the first optical identification of a quasi-stellar radio source (quasar), a star-like object that is a strong emitter of radio waves. 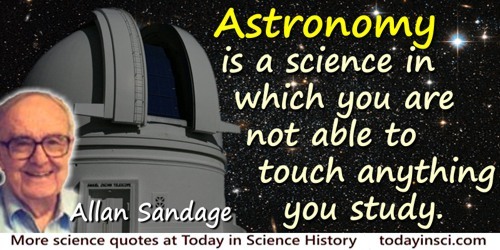 Astronomy is a science in which you are not able to touch anything you study. Everything is always in trouble at the frontier. 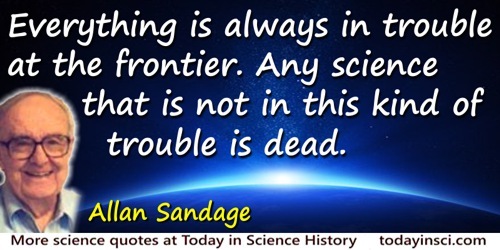 Any science that is not in this kind of trouble is dead. I find it quite improbable that such order came out of chaos. There has to be some organizing principle. God to me is a mystery, but is the explanation for the miracle of existence, why there is something instead of nothing. Science cannot answer the deepest questions. As soon as you ask why is there something instead of nothing, you have gone beyond science. So the universe will continue to expand forever, and the galaxies will get farther and farther apart, and things will just die. That’s the way it is. It doesn't matter whether I feel lonely about it or not. The greatest mystery is why there is something instead of nothing, and the greatest something is this thing we call life. In Through a Window by Alan Lightman and Roberta Brawer (1990). 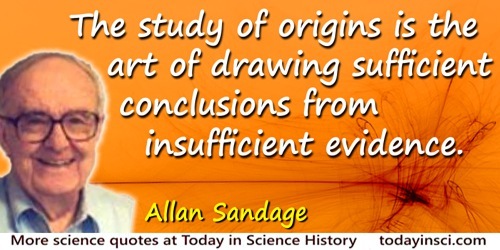 18 Jun - short biography, births, deaths and events on date of Sandage's birth.